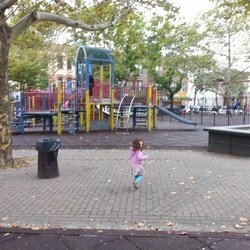 This playground is located in the Ridgewood neighborhood on the block bounded by Woodbine, Woodward, Madison, and Fairview Avenues. Ridgewood Intermediate School 93 (I.S. 93), directly northeast of the playground, was built in 1917, and the playground, jointly operated by Parks and the Board of Education, opened in 1962. The park consisted of a play area for tots and facilities for shuffleboard, basketball, handball, softball, and rollerskating for older boys and girls. The neighborhood for which Ridgewood Intermediate School is named straddles Brooklyn and Queens. The Mespachtes Indians who lived in the area were joined by Dutch and English colonists in the 17th and 18th centuries. The English named the region for its high wooded terrain. Ridgewood was gradually developed in the second half of the 19th century, as new horsecar, elevated rapid transit, and trolley lines improved transportation to Brooklyn. German-American builders erected thousands of rowhouses that attracted their friends and families to the area. More recent immigrants have included people from Eastern and Central Europe, Asia, and Latin America. 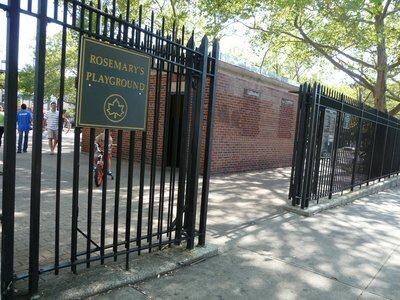 Rosemary’s Playground is named for one of Ridgewood’s brightest political leaders, who lived much of her life at 1867 Grove Street. Born in Brooklyn on February 7, 1905, Rosemary R. Gunning (1905-1997) graduated from Richmond Hill High School in Queens in 1922. Soon after she received the L.L.B. from Brooklyn Law School in 1927, she was admitted to the bar in New York State. Rosemary worked for a Manhattan and Long Island law firm during the Great Depression, and then served as an attorney for the Department of the Army from 1942 to 1953. She married Lester Moffett in 1946. Ms. Gunning entered the New York political scene as a Democrat and later joined the Conservative Party. One year after she attended the 1967 New York Constitutional Convention, Rosemary became the first woman to be elected to the New York State Assembly from Queens. During four two-year terms, her major achievements included bills supporting school decentralization and the creation of the Housing Court. Rosemary retired from the Assembly in 1976, but she remained active in legal, political, and community organizations. In her neighborhood, she served on Community Board 5, the Board of the Ridgewood Property Owners and Civic Association, and the Greater Ridgewood Restoration Corporation; through that organization she helped to place 3,982 local homes on the National Register of Historic Places, making Ridgewood one of the largest federal historic districts in the nation. She died on October 4, 1997 at the age of ninety-two. She was well liked both by friends and by political adversaries. 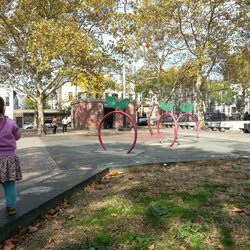 In 1997 Council Member Thomas V. Ognibene funded the $950,000 reconstruction of Rosemary’s Playground. Inspired by apple orchards, the design features newly planted Crab Apple trees and an apple-and-worm spray shower. Children from Ridgewood Intermediate School and the community can enjoy new spring animals, game tables, a baseball diamond, and reconstructed basketball courts. A new flagpole, benches, north arrow rosette, and decorative pavements further enhance this cozy neighborhood playground.